In the past most NGOs communicated with their members in a typical hub-and-spoke network: The NGO sits in the middle, information flows from this center to the members, money flows back from the members to the NGO. David Wilcox has written an interesting post about the ways how that is model was successful in the 20st century but will not work in the 21st. where he describes the positive and negative aspects, the fears and opportunities that the changes evoke in NGOs. If your members can find each other and communicate laterally, without even going through you as an organisation (but using your name to find each other or even to attach to their activities as a lable), do you fear the loss of control and try to restrict this or can you find creative ways of channeling this energy and these activities for the benefit of your organisation and your cause? Have you used Net-Map yet? Then please drop me a line. I would love to hear from you, learn from your experiences, see what worked and what didn’t and understand better how an idea like this spreads through the system and mutates/evolves as it goes. I (or some of our readers) might be able to answer some questions or help you over stumbling blocks, introduce you to people who work in the same (geographic or content) field and you can present your work to a bigger audience on this blog (as comment, guest-post or more elaborate case study). … if only you can find it. If you are like me, you do use other people’s websites and blogs for information and inspiration – on and off, with some favorites, other random encounters and lucky finds. But sometimes it feels like being in a very very (very) big library without a librarian or catalog. 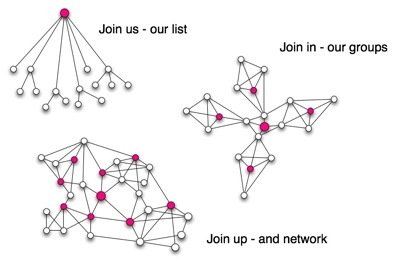 So I’m really excited that some more prolific browsers (my online life would be so much less inspiring without Nancy White) have set up “Community and Networks Connection” as a content hub that collects and organizes information around communities and networks. What is a content hub? Well it’s a place where content of a whole list of blogs that revolve around these issues is bundled and you get a combination of “newest posts” and “top posts” displayed and various ways how you can search for posts (on the participating blogs) that revolve around your specific area of interest. Policy approved – and implemented? I want to use this blog to help you to use Net-Map in your own work. This is why – every once in a while – I give you examples of how exactly I tackle a concrete question in the field. For example: Policy approval and implementation in Nigeria. The Nigeria Strategy Support Program of the International Food Policy Research Institute (IFPRI) aims at improving policy making and implementation through research. They asked us (Noora Aberman and me) to look into these processes, so that they will have a better understanding of where, when and how to intervene. Through our discussions we realized that we can really only understand this system if we look at two steps separately: The process in which a policy is made and the process in which it is – or is not – implemented. The new fertilizer policy we are looking at aims at making Nigeria independent from fertilizer imports by increasing the local production. It has been approved – but is still waiting to be implemented. When Noora is going to the field, she will mainly undertake two activities: In individual interviews with people who were involved in (as policy makers or observers) the writing and approval of the policy she will find out, what the formal and informal networks were, with which the actors influenced this process. After a day to consolidate her findings and develop a preliminary common map of her interviewees’ understandings, she will facilitate a workshop that includes her interview partners plus some actors who will be crucial for the implementation (but weren’t involved in the policy-making). She will present the policy-making map to the participants for comments and validation and then venture into the next question: “Who can influence, whether and how the new policy will be implemented?” This will be the leading question for a group exercise of drawing one common map together, identifying crucial actors, conflicting goals, bottle-necks and possible strategies and coalitions to move the process along smoothly. So while the first step (individual interviews) has a very strong focus on “finding out”, the second step (group process) will combine “finding out” and “moving things along”. There is one thing that I often hear, when I do Net-Map interviews: People admit that they are not quite sure about the influence of actors, the networks that connect them , the how and the why. The easiest solution is to let them off the hook and say: Well, if you’re not sure, let’s not do it. But last week I had another experience that reinforced to me how valuable informed guessing is. If I know very little about a situation and am faced with an expert who is just overwhelmed with its complexity I’d say the best solution is to acknowledge together that this is just a best guess and that we won’t use this as a truth written in stone. By freeing the interview partner of the responsiblity to present the absolute truth about the matter (who would be able to do that anyway, talking about social networks? ), you create a safe environment, where you can together explore the knowledge and insights he or she has right to its edges, where things get blurry. Why is that? How can that be? Shouldn’t you know what you know? I suppose it has something to do with the fact that we learn in many ways, by observing, experiencing, reading, talking etc. All different kinds of impressions enter us all the time. But to get awareness of what we have learned, we need to find an expression for this knowledge, either by putting it into words or pictures or by doing something. That helps us to structure our new knowledge, connect it to what we learnt earlier, give it meaning etc. Even if we just put it in words in our own mind. So in general, a method that allows you to put a part of your knowledge into pictures and words helps you to know what you know. But especially if we enter a field where you have gathered a lot of different impressions and are unclear about what they mean, how they are connected and which ones are true, you might be very hesitant to express them, because you don’t want to look confused or make misjudgments. However, I’m sure that it’s a much bigger step forward to get some tentative structure and meaning into a very cluttered field of understanding, than to make some minor adjustments to an already very well organized field. This is why you can create such a powerful process if you manage to make people feel comfortable enough to start making informed guesses and developing structure and meaning out of those. The only big responsibility you have is to keep your end of the promise: It’s very tempting to use the results just as any kind of data, just as if the interview partner had been sure about the assessment. So even after the actual interview situation is over it’s part of the interviewers responsibility to keep in mind that the interview partner wanted this to be seen as a tentative picture – make sure to present it as such and to follow the leads and open questions you discovered while mapping.